Programs that provide more access to fresh, healthy foods—and help them grow it—can create positive change in low-income communities. In some parts of Jefferson County, Kentucky, you can’t walk more than a mile without coming across a grocery store, food cooperative, or farmers’ market where you can stock up on nutritious fruits and vegetables. But in other parts of the county, people lack access to fresh produce; they live too far away from full-service groceries, they’re poorly served by public transit, and what they have is limited to what smaller convenience stores carry. Jefferson County is representative of a broad pattern across the United States. While wealthier neighborhoods and communities offer access to lemon-garlic kale salads and strawberry banana smoothies, poorer areas have little choice other than sugary or salty snacks at gas stations, processed microwaveable convenience foods from the corner store, or local fast food chains. The U.S. Department of Agriculture mapped out what it calls “food deserts,” or communities where at least 500 people or a third of the population live a mile from a supermarket or large grocery store in urban areas, or more than 10 miles in rural parts of the country. What the government found was that nearly 55 million people are living in these areas. While some so-called food deserts are clustered together into larger regions that lack access to fresh produce, others exist as smaller islands of food poverty amid areas with better options. Food deserts primarily affect low-income neighborhoods, and research from Johns Hopkins University shows that Black and Hispanic neighborhoods have fewer large supermarkets and more small stores that are more likely to carry primarily junk food. But accessibility plays a bigger role in preventing access to fresh, healthy food than income does, Lauren Vague Stager says. Stager is the business development manager at Uplift Solutions, a New Jersey-based nonprofit consultancy and community development financial institution that supports food businesses, governments, nonprofits, healthcare systems, and other organizations in improving access to food, promoting good health, and investing capital in underserved communities. Stager says that once a grocery store offering fresh produce opens in a so-called food desert, it may take a while until people begin to change their shopping behavior, visiting the new store or buying new foods that hadn’t been able to get before. After an adjustment period, however, market penetration ends up being the same as in other areas. “That would suggest that affordability is not an issue,” she says. Fresh and healthful food lowers people’s risk for obesity and diabetes and provides economic benefits as well. Awareness of these “food deserts” also has been increasing and a proliferation of for-profit businesses and non-governmental organizations have begun to fill in the gaps. Across the country, the organization helps bring farmers markets, supermarkets, co-ops, and healthy corner stores to underserved communities—as well as providing technical and business support to preserve existing supermarkets. It estimates that it has helped create healthy food access for around 300,000 people between 2009 and 2015. The Englewood community of Chicago, which had a 46.6 percent poverty rate based on census data collected between 2008 and 2012, is one area where the tide is turning. The nonprofit organization Growing Home has provided education and job training in the area for 15 years. As community members developed a quality of life plan for the area, they included access to fresh food on the list in addition to new jobs and training. Growing Home works to thread all of these problems together, growing food on vacant lots while also using its farm to provide a hands-on paid job opportunity to people with barriers to employment. “We work with people when others just shut their door in their faces,” executive director Harry Rhodes says. “People who have criminal records, some of whom have violent criminal records. 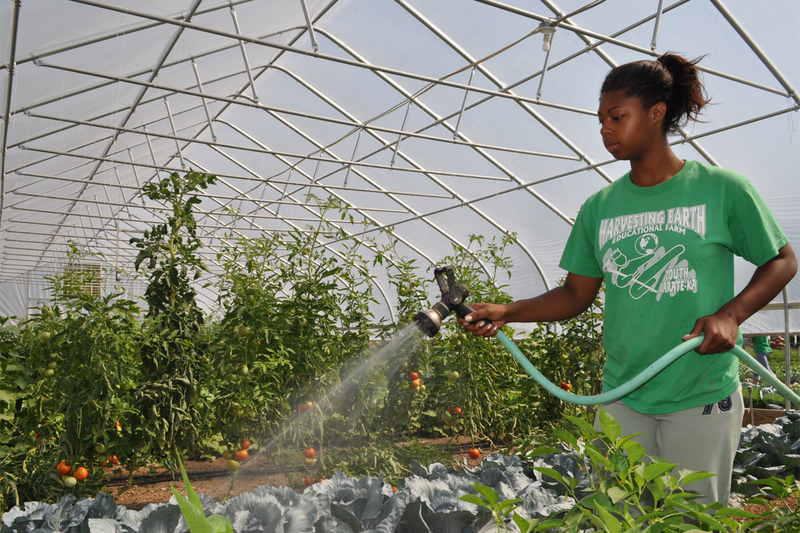 People who have been through the system, have been incarcerated and are ready to make a change in their lives.” The nonprofit provides work experience and readiness training at farms while also helping people conquer other issues they’re facing. For example, they partner with Cabrini Green Legal Aid to get criminal records sealed or expunged. In 2016, 52 people went through Growing Home’s 14-week work and study program, where they worked on their farms while preparing themselves for permanent employment after “graduation.” A little over 80 percent of the participants completed the program, and 95 percent of those went on to find permanent jobs. Growing Home not only offers produce at significantly reduced cost at 39 farm stands in the Chicago area, it also hosts community education workshops and events such as cooking demonstrations. This helps create an atmosphere where people want to be at the farm and spread the word about their work, and also helps shift the demand away from more convenient but unhealthy food choices. Growing Home’s educational outreach efforts help teach people the importance of buying fresh and healthy food even when it’s not as quick and easy. Rhodes says the goal is to turn Englewood from a so-called food desert, a term he and other community members dislike, to a food destination. A Whole Foods store opened in the area last year. Nonprofits also work hand in hand with other groups addressing poverty, the Arizona-based mobile produce market Fresh Express, which has served more than 22,000 customers in its three years of service, not only sells fresh produce at wholesale prices to senior centers, it also partners with UMOM New Day Centers, a family housing and shelter for homeless families. UMOM runs a culinary training program and a café, so Fresh Express donates leftover food to its kitchen for meals for families served by the center. Fresh Express also keeps a cooler on the UMOM campus to store extra produce there. It’s not always easy for people living in senior centers to get fresh fruits and vegetables, unless, of course, the Fresh Express bus makes a stop. The mobile food market on wheels is run by the Discovery Triangle Development Corporation, a nonprofit that brings business investment and development into the Phoenix and Tempe area. Fresh Express purchases food from farmers at wholesale and sells it without a markup. The nonprofit covers operational costs through grants, sponsorships, and donations. “Our target demographic is low-income individuals and families in USDA designated food deserts as well as other populations that face additional barriers to healthy, affordable foods,” says Elyse Guidas, Discovery Triangle’s executive director. Some of the Food Express stops are at senior centers in areas where grocery stores are accessible through public transportation. Some residents have access to vehicles, but many of them have reduced mobility, or simply find the mobile market more convenient and affordable. At some sites, Guidas says, customers are waiting by the door as soon as the bus arrives. “We’ve done informal surveys asking people if Fresh Express wasn’t there where they would shop and they say, ‘We don’t know. We wouldn’t shop. We’d go to Circle K. We’d go to the liquor store. We’d go get a bag of Cheetos,’” she says. “For a lot of our customers, this is one of their only lifelines and access to healthy food,” Guidas says. This article is reprinted from YES! Magazine. Urban farming photo CC-licensed by the Michigan Municipal League. I'd like to hear about more places that are food deserts and what is being done. What has Uplift Solutions opened brought forward in the way of food access? I used to work in a food desert, there were kids that ate dinner from the ice cream truck and lived off of Hot Cheetos, a brand that markets themselves heavily to low-income children. There was also a lot of empty land in that neighborhood. Using this land for community gardens would bring food security and more personal control over one's own diet. Not every neighborhood needs a Whole Foods but every neighborhood should have access to healthy options. Your article was very informational. If possible, could you please provide some data on how I could help solve this problems? Example; opening a low cost food store or volunteering.